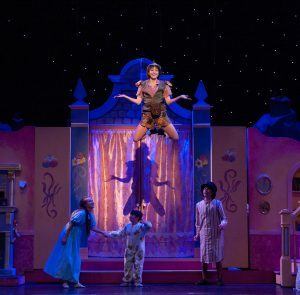 If anyone questioned if Shelbie Mac is the greatest young talent to come down the pike since the late Cynthia Owen, all doubts have been erased with her starring role in Peter Pan, currently playing the boards at the Jefferson Performing Arts Center on Airline Drive. Mac, who has previously starred as Charity Hope Valentine in Rivertown Theaters’ Sweet Charity and who played Patty Andrews in the National World War II Museum’s original production of America’s Wartime Sweethearts for two years, has also added excellent scenic designs for several shows through the last three seasons around town. But if there ever was an argument for this high-flying actress, belter and hoofer to put down the paintbrush and stay put on the stage, her performance as the boy who would not grow up is it. Mac embodies all the puckish charm of the prepubescent boy created by James M. Barrie that has kept children and their parents entertained for more than a century, a role traditionally filled by a woman. She sings “I Gotta Crow” with glee and tenderly introduces us to “Neverland” in the songs written by Morris Charlap with additional music by Jule Styne and lyrics by Betty Comden and Adolph Green, a stunning Jewish musical concordance that, sadly, never repeated on Broadway again. Mac flies with absolute abandon in the exciting “I’m Flying” in Act One and in key scenes in Act Three, executing perfect vertical circles and lateral swoops across the stage. She captivates with her boyish bravado, but is generous in her scenes with the other actors. This production, the kickoff for the 41st season of the Jefferson Performing Arts Society, was opened this weekend to a full house of adults and kids to witness a superb cast of seasoned and young performers given marvelous direction by longtime performer “Uncle” Wayne Daigrepont. Daigrepont may have reached the pinnacle of his career with this mammoth production that includes a full-blown orchestra and world-class choreography by Jauné Buisson, a woman whose stellar status has been proven in previous outings with Summer Lyric Theatre at Tulane. Buisson’s notable work is best seen in Act Two’s “Indian Dance,” “I Won’t Grow Up” and “Ugh-a-Wug” in which the mostly child actors execute detailed routines like experienced professionals. A big shout out to Scarlett Saizan as Tiger Lily, who serves as the focal point for the Indian dancers. Buisson’s choreography in Act Three in the scene at the pirate ship and the finale is also tremendous. As Captain Hook, Jimmy Murphy absolutely enthralls in the musical role Cyril Ritchard first unveiled. A previous Hook in 2003’s production opposite Amy Alvarez, Murphy seems much more relaxed and comfortable in the role in this outing. He is charmingly devious and leads his band of marauding pirates with glee and delicious villainy. The pirates are also well choreographed and sing quite well, especially in Act Three, when they praise the depravity of their dastardly leader. 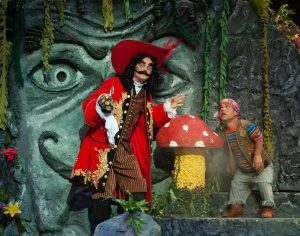 Matthew Shurley as Smee is a standout, whose size as a performer looms large. He handles his comic lines with Murphy quite well and the decision by Daigrepont to cast him is inspirational. Bree Hollis is another reason this production excels. As Wendy Darling, she serves as a measured counterpart to the impetuous youth of Pan and her singing is delightful when coupled with Mac’s. Hollis, a former child star who was outstanding in the titular role of Annie some years ago is maturing into an ingenue of great stature and substance. Taking over the conductor’s baton this outing is Kyle Aucoin, who also served as music director. Aucoin takes the orchestra through its paces with remarkable skill and he will be someone for whom we should keep an open eye – or ear – in the future. The amazing history of the character of Peter Pan is filled with theatre lore. Although James Barrie’s famous character first appeared in print as a reference in one of his novels, his character began to thrill audiences when the story was adapted into a play in London in 1904. After the two World Wars that followed, Leonard Bernstein wrote music to accompany another play starring Jean Arthur about Pan in 1950 that created new interest in the tale. That was followed famously by the Walt Disney Studios, who created a 1953 animated feature musical with songs by Sammy Fein and Sammy Cahn among many other songwriters that is still a favorite among youngsters today. Another favorite retelling of the Barrie tale is Steven Speilberg’s “Hook,” a 1991 film that had Robin Williams portray a grown-up Pan, who had to reassume his character in order to save his children. Because it was shown over television, Peter Pan was the first Broadway musical experience that most members of the “Baby Boom” generation remember. Starring Mary Martin in the titular role and Cyril Ritchard as Captain Hook, it opened on Broadway in 1954 and enjoyed two live broadcasts in color over the next two years in 1955 and 1956. The 1956 broadcast became the standard recording preserved in black and white kinescope, a film process that predated standard videotape recordings. A third live NBC telecast in 1960 with a new cast of youngsters was also added to NBC’s repertoire for preservation in color and on videotape, but the performances were not as sharp as the earlier iterations. It is no longer in print. Other notable Broadway revivals and national tours included Sandy Dennis and Cathy Rigby in the title role. NBC cast Allison Williams in a broadcast version of the musical in 2014 that also starred a miscast Christopher Walken as Hook. Locally, Ross Quinn, an actor with a high vocal range was able to cover what has been written for Pan, a part described as an alto, covered the role at the Rivertown Theaters for the Performing Arts in 2015. It was the first time that the traditional female part went to a male and still holds a special place in local theatre history as a result. But back to the current production. There are so many good things about this JPAS production, but there is one major problem with it. It only runs two weekends. So, don’t let this opportunity pass by. Go see this amazing production and see why Shelbie Mac is a rising star whose light is destined to blaze long and bright. Peter Pan continues its run with evening performances on Friday and Saturday, October 26 and 27 at 7:30 p.m. and a final Sunday matinee on October 28 at 2:00 p.m. at the Jefferson Performing Arts Center, 6400 Airline Drive, in Metairie through October 25. For tickets click here or call 504-885-2000.